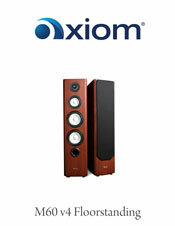 Winner of the GoodSound.com Great Buy Award! If you'd like the startling definition and realism of the M80 tower in a more compact, 8-ohm version, check out the M60s. A three-way system with triple vortex porting , a dedicated 5 1/4-inch midrange driver, titanium tweeter, and dual aluminum woofers, the M60 effortlessly reproduces the full musical spectrum. 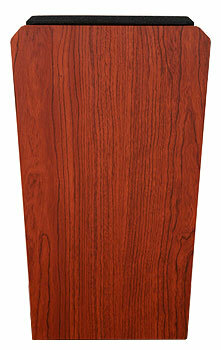 One of our best-selling speakers, the M60 is now available in two versions; standard and High Power. The latest High Powered version has all the same midrange and high frequency detail that makes the M60 such a popular model in our line but has much increased power handling and maximum SPL capabilities in the bass region. The High Powered version is best suited for systems that do not contain a sub-woofer, which is likely the case in most 2-channel systems which are gaining a lot of popularity these days. This is the go-to speaker for the demanding audiophile who wants a speaker that performs equally well with music and movies, and wants a speaker that can handle the demanding dynamics of Dolby Digital 5.1 surround sound or thrilling 2-channel stereo orchestral playback. We guarantee these speakers will be the envy of the neighborhood! If it is full range playback without a subwoofer that you need be sure to select the High Powered version. Outstanding for stereo listening, the M60s are an excellent foundation for high-end home theater. 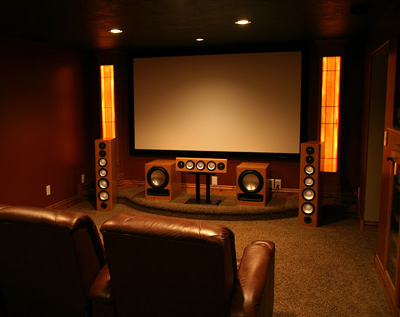 Precise imaging with unprecedented clarity and deep bass will redefine how you think of home theater. The 8-ohm in the standard version and 6-ohm in the High Powered version make the M60s easy-to-drive speakers that will create ultra-clean, high-volume levels in large rooms . The standard M60s have available in Customize Yours options for bi-wirable inputs and die cast baskets. The High Powered version comes stock with these options. Carpet spikes are available for both in Customize Yours. 37.5" x 9.25" x 15"
I am sure I don't have to tell you but these speakers sound amazing. I had a set of JBL's from the late 80's that I thought were the best and 'they don't make them like that anymore'. Where as late 80's JBL rock your speakers make them sound like, well, thirty year old speakers. I have never bought speakers without listening to them before but the fears was unjustified these are a 10/10. When I replace my rear speakers you will be hearing from me again. Oh and by the way thanks for shipping them to me for the weekend. Since I have to work labour day this is my long weekend. You just made it a whole lot better! Ordered a pair of M60 v3's that were custom maple, but refurbished. I called Axiom and spoke to Brent who assured me they were in very good condition and had been tested to ensure audio quality was as good as new. 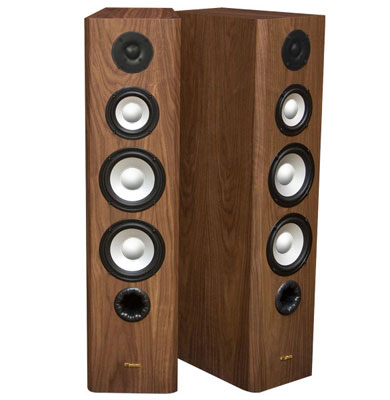 We ordered the speakers to replace a 14 year old set of Paradigm Monitor 7 v.2's. The M60's were at our house within days and once we set them up and put on some music, even my wife could tell there was a huge difference! We couldn't believe what we had been missing for so many years. The M60's were perfectly balanced with nice highs and tight lows. We've been listening to all of our music over again. Highly, highly recommended! Quick and client friendly service. Superior quality product with fantastic sound. We are very pleased with our purchase. Last year I purchased a set of M22 speakers after doing plenty of research into different brands. At first I was apprehensive about ordering online, but all the information I could find on Axiom rea ssured me that this was not a fly-by-night operation. The service was excellent and the products were great! My only regret was that I didn't find this brand sooner. After having such a good experience with my M22s I went back to Axiom again and bought a much larger set of M60s. In a word, 'WOW' I can't believe the sound quality and build of these speakers is so good at the price they sell them for. I'll keep these speakers for a long time and maybe next year add a sub to my system. Thank you Axiom. I bought the M60s because of sound (and build) quality, excellent reviews, and value for the money. I'll leave a review when I get a chance, i.e., when I can next draw my self away from listening to my M60's! love my M60s best sound that I have heard in a long time. You even impressed my son and he has a lot of Carver amps.